This has been developed to eliminate the CEL=Check Engine Light and give you the best protection at the exit and entrance of the PCV system. for all the 2015-2019 F150 trucks as well. 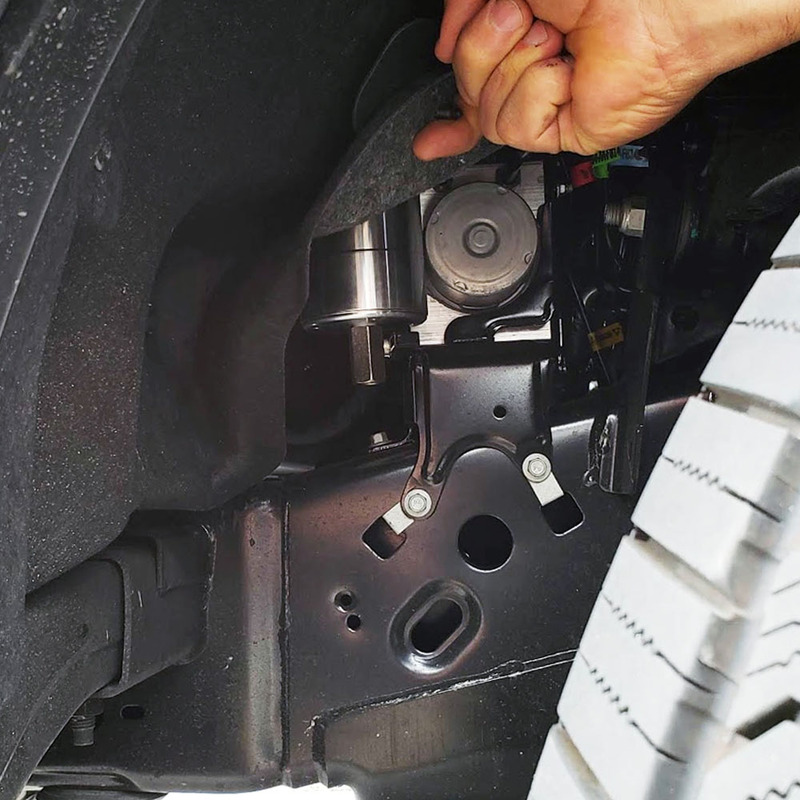 The ECSS is a brand new option for the F150 Ecoboost Trucks and SUV's. that cause the Variable Pressure Sensor voltage to go out of range and trip the CEL - Check Engine Light. The Ecoboost Engine always have to protect both the clean side and the dirty side of the PCV system. Keeping it simple for the Clean and Dirty side of the PCV. amount of condensation that gets collected reducing the need to drain it more frequently. the primary check valve to close the PCV no longer has anywhere to get vacuum from or release the positive pressure from the BOOST/Blow-by. BOOST is and it only has vacuum drawing from the intake side of the turbo. to address this problem correctly. VPS sensor and keep that unsightly CEL off. We are in the process of releasing this to work with any catch can system as a stand-alone ECSS system. I hope this helps with the PCV function and understanding how to properly protect the Ecoboost PCV System from Oil Ingestion at BOTH sides of the PCV. work with this catch can? looks like a good clean install for the 2018. Thinking about installing a catch can system, to see if it controls fuel dilution issues. I have sent 4 oil analysis samples in, & last 3 have been 3.4-4.0 % fuel dilution in a 2400-3100 mile OCI. If I don't see improvements in fuel dilution, can I return? Last edited by Clamb; 01-14-2019 at 09:45 AM. fuel dilution issues. I have sent 4 oil analysis samples in, & last 3 have been 3.4-4.0 % fuel dilution in a 2400-3100 mile OCI. offer the very BEST One-Way Crankcase Breather only AVAILABLE from UPRproducts. in internal temps. A big plus for hard driving and towing as well. UPDATE, just read through the description. So I would want this ECSS option for the 2018, Correct? That is the Driver side PCV sensor at 1:19-1:50 in the video? Last edited by Clamb; 01-14-2019 at 09:49 AM. Wanted to share exactly what the New UPR ECSS looks like and be sure you have the correct numbers for the UPR ECSS Kits. breakthrough with the Ecoboost platform and has become an integral part of all New UPR Ecoboost Catch Can Systems. This image has been resized. Click this bar to view the full image. The original image is sized 1000x1000. These Brand New System has two Utility patents pending. UPR only uses OEM or better components throughout all our UPR Plug n Play™ Catch Can Systems for the Ecoboost Platform. 2015 and newer truck Kit part numbers are listed below to make it easier when ordering. Last edited by UPRjoe; 01-14-2019 at 01:03 PM. So the new Electronic clean side separator doesn't allow any oil to be drawn into the intercooler from the drivers side turbo? Is it designed to collect it, & allow it to fall back into the valve cover? This does not connect to the catch can at all, & looks like it has a check valve installed. It must still draw (filtered) air externally, is it serviceable? All the oil residue vapors are removed from the passenger side pcv valve, right? Just questioning if it can still be run with the oil fill breather replacement. I would feel safer using a catch can with a breather installed, in case of a malfunction with a check valve, which could cause excessive pressures inside the engine. I am still curious to see how accessible it is to drain the can. Is there a drain hose attached to empty it? Sorry for all the questions. I am a hands on kind of person, & need to see how it works & figure it out before I make a decision. I have logged 3 oil analysis samples, after a break in sample was submitted, & will likely do 1 or 2 more. I would like to see if this product shows any beneficial results that can be seen through oil analysis. Do you have any test data, supported through oil analysis before, and after installation? 1. There is no check valve as one cannot be run on a dedicated bi-directional line for the PCV fresh air intake. 2. We run the UPR One-Way Breather in conjunction to protect against boost/pressure spikes that can flow the reverse direction through the intake side of the PCV during WOT or heavy boost. 3. The oil level internally goes up about a quarter way before it will return back into the valve cover. 4. The only testing we do it to keep track of oil travel/control and this has done the best job and requires no maintenance. I thought that the ECSS completely blocked the valve cover, and was a filter to draw outside air through it, pulling all required vacuum from the passenger side, while maintaining vacuum to the electronic sensor, so it would not throw a CEL. Still not sure if you answered my question about draining the actual catch can mounted below the air intake on the F150. Am I able to access this easily from under the truck? I have the factory skid plate. How hard is it to reach the valve? Do you attach an extension hose, & drain it through the wheel well opening. 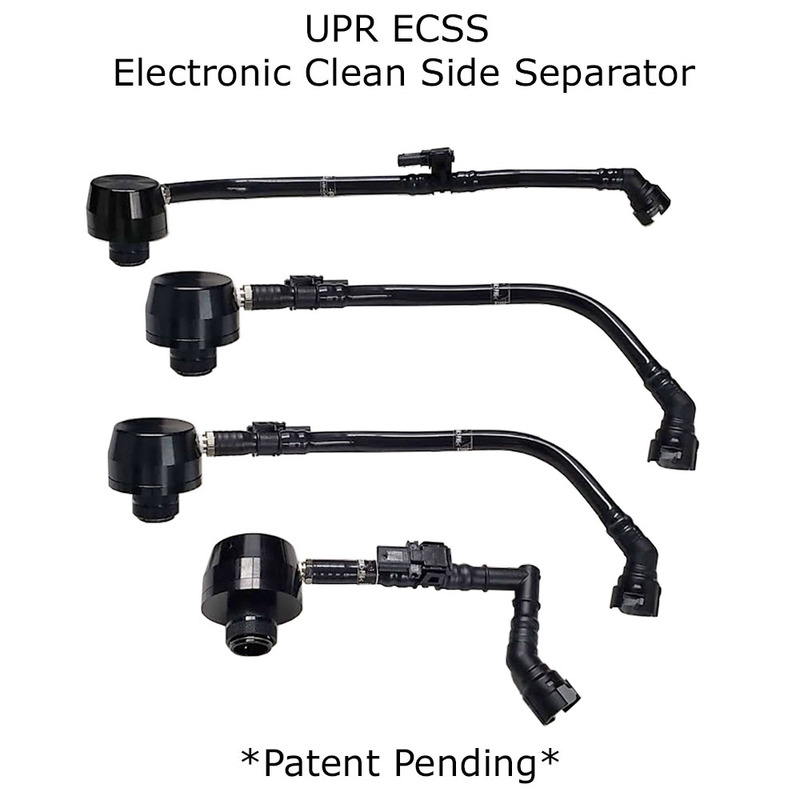 The UPR Drain Valve is easily accessible and easy to drain. it from the front driver fender well. drain valve with the front wheel turned all the way left. You can run a hose if you like. But, it's not really needed. Can the ECSS be used by itself, & purchased separately, without the entire catch can? It would limit the amount of residue that I have been noticing in the hoses to the intercooler.